Gerry George is a RADA trained classical actor, and former Variety impressionist, whose track record in legitimate acting  in recent years  includes strong character roles in films, stage, television plays and commercials, in addition to numerous voice-overs. In television comedy, he has done featured guest work with Lenny Henry, Paul Whitehouse, and Frank Skinner, and is particularly proud of a promotional film he did  one-on-one  as a spoof theatrical agent with Ronan Keating. In the last decade he has played cameo roles in a litany of cinema films, including Evita, starring Madonna, Buffalo Girls, starring Jack Palance and Anjelica Huston, and latterly Wilhelmina, starring the Dutch star Annawille Blankers, in which he played a wartime Winston Churchill. 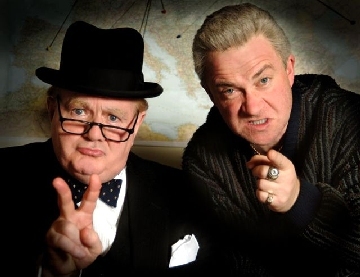 In June 2003 he flew to the Isle of Man, to take the role of Old Churchill, in Churchill: The Hollywood Years, a satirical romp, for the cinema, starring Anthony Sher and Leslie Phillips. One-time child actor, and Variety juvenile, Gerry returned to showbusiness in 1981, after more than two decades in tabloid journalism, since when  in addition to performing  he has written two books, the first of which, featuring the Northern comedian Frank Randle, has been adapted for the big screen, and is due to go into production in next July. CHECK-OUT GERRY GEORGE, ON FACEBOOK - AS "CHURCHILL, BY GEORGE"! CHURCHILL, BY GEORGE, AS AN EXHIBITION FILM-PIECE IN A TOP LONDON ART GALLERY ! in a WWII *whistle-blower* that will blow your socks-off ! Actor Gerry George is seen as Leader-of-the-Opposition Mr Winston Churchill addressing honourable members at the dispatch box in the House of Commons, during the critical Yangtse Incident in 1949, when a class II frigate of the Royal Navy, “HMS Amethyst” was fired-upon by artillery and troops loyal to the then revolutionary leader Mao Tse Tung; during which time the beleaguered ship's bridge, steering-gear and engine rooms were wiped-out, seriously wounding the captain and the coxswain, plus several sailors on board. Flying-out to Shanghai to take part in the production, during January and February, last year, Gerry was told by China's most-celebrated director, John Woo, that after this 100-episode biopic was released he would become the most famous face in China, after the late Chairman Mao, whose life and work this major biopic focuses upon. 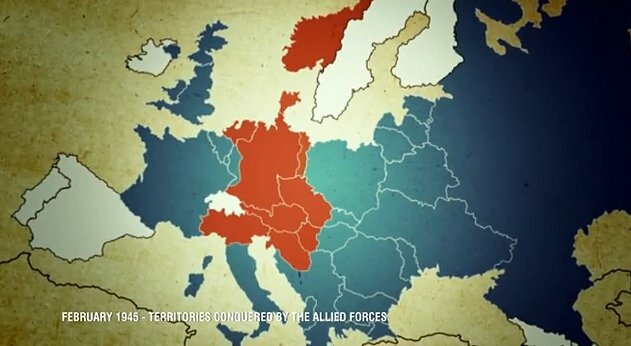 The first episode (shown above), went out to every home in China last week, and the feedback Gerry has received since has been phenomenal, with calls for his further services in the role of Churchill, coming in from all quarters, and not least in Asia and Europe. “This was a tremendously satisfying experience for me”, said Gerry, “my having been given a conducted-tour of the vast Shanghai Studios, which are in themselves like a scale-model of pre-war London, with trams, cinemas and coffee houses - all of them fully-functional, since this venue has a dual role as a Film Studio Theme Park -which features prominently in the Shanghai Tourist Guide, and is visited by hundreds of thousands of European visitors, every year”. Winning The Web-War With Winnie ! Peer 1 Hosting, of Vancouver, Canada - one of the planet's biggest operations in the Media world - chose actor Gerry George, of Churchill, By George ! to mobilise the language of the English-Speaking Peoples, and send it into battle, in their on-going war against the competition, and thereby retain their winning place in the international web-hosting war. on the BBC Radio 4, FM programme, interviewed by Steve Evans. The programme is produced and directed by Rupert Allman. Final checks on-set, in Sardinia - and last-minute instructions from Ealing Met Film School, student-director, Giacomo Costa,34, (right, standing) - during the filming of *The Choice*, in his hometown, Cagliari. 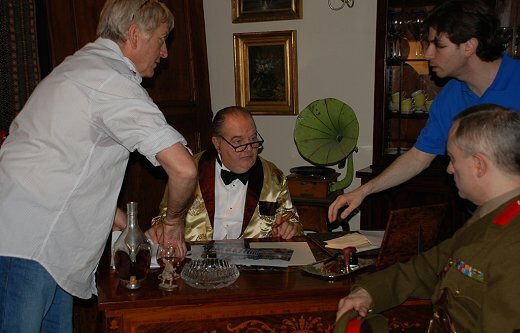 Left, a crewmember replenishes the brandy glass of Winston Churchill (Gerry George). Seated, is Michael Good, who plays Colonel Locke; an almost ethereal character who takes Winnie and his conscience to task in this controversial, yet thought-provoking anti-war movie, albeit as he was viewed by the Axis powers, and the prostrate and bombed-out peoples of Germany and Italy, by the end of WWII. 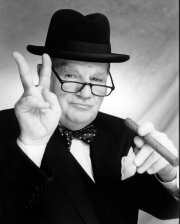 GERRY GEORGE, AS CHURCHILL ON THE ITALIAN RIVIERA ! 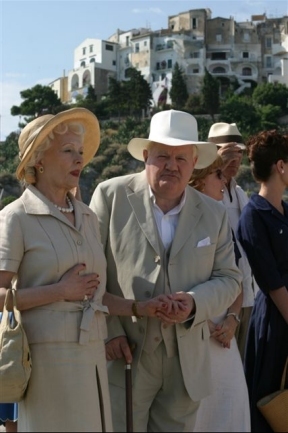 Relaxing in between scenes, in the sweltering heat of Sperlonga, on the Italian Riviera - during the shooting of veteran director Giorgio Capitani's romantic movie *Callas e Onassis*, for Lux Vide SPA pictures of Rome - is Gerry George (Churchill), with actress Elena Croce (Lady Clementine Churchill). Gerry, who has a pivotal role in this major mini-series, intended for worldwide television, has been out there since May, and commutes on a weekly basis from his London, Ealing, home. "It's hot work, but very rewarding, and - if nothing else - for the magnificent weather and gorgeous food" said Gerry, who will be working on the movie, until August " and that's not to mention the elegant and beautiful Italian ladies." Other locations for this film, which he has already visited, include the larger Riviera town Terraccina, and Viterbo, an ancient spa city, about one hour's drive out of Rome. Next, he is off to Trieste, and thence to a mock-up of the Onassis yacht, *Cristina* cruising in the Greek Islands. The two principal players include the beautiful Italian star Luisa Ranieri, as Callas, with major, French star, Gerrard Darmon, as Onassis. Winston Churchill turned football referee on Friday, March 13 - or rather, Gerry George who impersonates him, did - when he visited RAF Halton, Buckinghamshire, to do his bit alongside officers and airmen, hiding their bruises while strenuously sitting-it-out in a series of hectic Crab Football knock-abouts, staged to raise funds for Red Nose Day. The 2006 FIFA World Cup is upon us. Now one bond unites us all, to support England until victory is won and never surrender ourselves to failure and shame, whatever the cost and agony may be. is the latest addition to Gerrys stable of characters. Here he is all kitted-out for the role, in which he has already performed with considerable success, at corporate functions and sales-orientated seminars, all over the UK. Last month (November 04), Gerry  as the intrepid Captain  spearheaded a team of appropriately garbed sales directors, at the Cadbury/Schweppes/Trebor sales seminar, in the Hilton Metropole Hotel, at the Birmingham International Centre. Performing before nearly 1,000 young sales representatives  all highly successful operators working within this corporate juggernaut  he earned rousing cheers and applause, clowning his way through a spoof sketch presiding over his mock platoon of 'chocolate soldiers', before departing, only to re-emerge, later on in the show, out of clouds of smoke, and to the strains of Beethovens Fifth Symphony, as the wartime Winston Churchill, alternating his famous Victory 'V', with a hand-crooked, Cadbury C.
"My Lancashire hometown of Ashton-under-Lyne, is not all that far from Arthur Lowes Derbyshire neck of the woods", said Gerry, "and I have always been able to handle that strident accent which Arthur adopted, when assuming his pompous, blustering, and yet so lovable, legendary character." Gerrys biggest ambition  where Arthur Lowe is concerned  is to one day be able to reprise the character on television. BANNED, FOR LOOKING TOO MUCH LIKE CHURCHILL ?